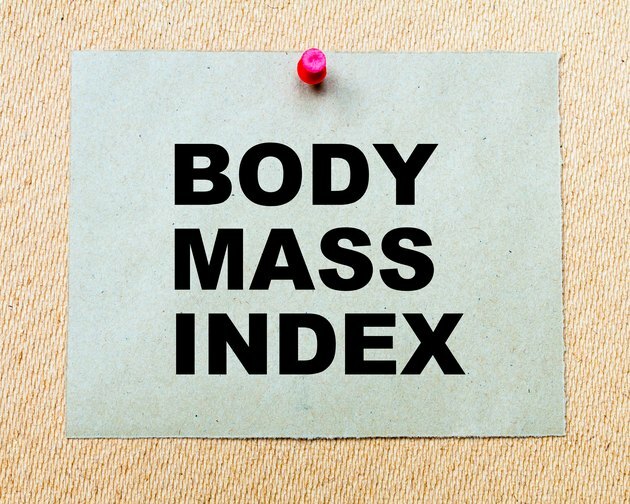 Knowing the average BMI -- body mass index -- for your age group can help you determine how you compare to other people of the same age, but, even if you have an average BMI, it doesn't necessarily mean you're healthy. In fact, for many age groups, having an average BMI may classify you as overweight. Body mass index is interpreted a bit differently in children than in adults, as they're still growing and mature at different rates. Instead of having just one set range of healthy BMIs, it's necessary to check a BMI-for-age chart to check whether the BMI is between the 5th and 85th percentile for that age group. For boys and girls between 2 and 7 years old, the average BMI is somewhere between 16 and 17 as of 2010, depending on age and gender, but the range of what is healthy is broader than this. For example, a 5-year-old boy is considered healthy with a BMI from 13.8 and 17. The average BMI for an 8-year-old boy is 17.9, and girls of the same age have an average BMI of 18.3. By the age of 12, the average BMI for both girls and boys is 21.3, with a healthy range of about 15 to 21.8 for boys and 14.8 to 22.5 for girls. Because teenagers are still going through puberty and growing, they can be healthy even if their BMI falls a bit outside what's considered healthy for an adult. The average BMI for a 13-year-old boy is 21.9; for a girl of the same age it's slightly higher, at 22.1, The healthy BMI range for 13-year-olds is 15.5 to 22.6 for boys and 15.3 to 23.3 for girls. By the age of 18, the average BMI for a boy is 26.1, and for a girl, it's 24.6. The healthy range is 18.2 to 26.3 for boys and 17.6 to 26.1 for girls. For adults, the healthy BMI range is from 18.5 to 24.9, regardless of age or gender, and anything over this means you are considered overweight for your height. The average BMI for women age 20 and older is 28.7. Women 80 years and older have the lowest average BMI, at 26.7, followed by those between 20 and 29 years old, at 27.5, and women from 60 to 69 have the highest, at 29.6. For men, the average BMI for those 20 and older is 28.6, with the lowest average in the 20-to-29-year age group, at 26.8, and the highest in the 60-to-69-year age group, at 29.5. These average BMIs all fall within the overweight classification, meaning the average American adult is overweight. Just looking at the average BMI might not tell the whole story. People tend to fall into one of four different trajectories in adulthood, including normal weight, overweight, early adulthood obesity and late adulthood obesity, and they usually stick within these groups, according to an article published in the International Journal of Epidemiology in 2011. BMI isn't necessarily an accurate predictor of body fat, either. It often overestimates body fat in those who are very muscular, and underestimates it in the elderly. BMI also doesn't take into account where you carry your weight. Having a large waistline is an indicator that you may have an excessive amount of a dangerous type of fat called visceral fat that surrounds the organs. The waist-to-hip ratio can be helpful to determine if you have this type of dangerous fat. Divide your waist circumference in inches by your hip circumference in inches. Your waist-to-hip ratio should ideally be below 0.8. A higher number indicates an increased risk for heart disease and other health problems.